For much of the thousand years before the late 19th century, Japanese history was marked by civil wars and factional power struggles. In Japan’s insular and highly stratified social structure alliances shifted between the Emperor, the Shogun or supreme military commander and the daimyo or powerful landholders. Much of the fighting was carried out by the warrior class, or samurai. The collection consists of body armour, textile underclothing, textile banners, horse armour and storage material. The armour bears an insignia claimed to be that of Koma Kaemon Samurai officer of the Bizen clan. The Body armour components are: a cuirass (do), thigh guards (haidate), sleeve armour (kote), shoulder guards (sade), a face mask (mempo), neck guard and throat ring and Helmet (kabuto). The underclothing components are: breeches, jacket, sleeveless jacket, belt and neckties. The horse tack consists of: saddle, stirrups, halter, reins, girth strap and bit. The storage materials consist of storage boxes and wrapping papers. A banner is also part of the armour and horse tack collection. An entry in the musuem's accession register from the time of purchase (1948) states that the armour dates from 1775. This has not been verified. 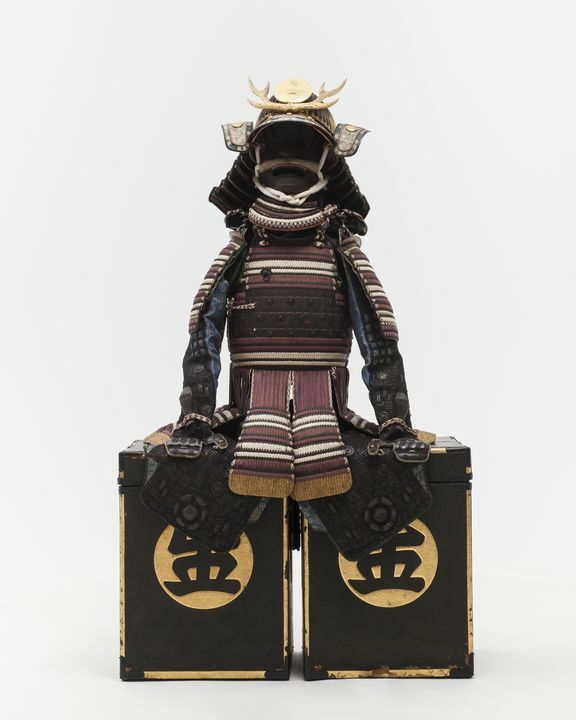 An entry in the museum's accession register from the time of purchase (1948) states that the armour belonged to Koma Kaemon, a samurai officer from the Bizen clan. This has not been verified. Purchased by the museum from Lawson's auctioneers, Sydney, in 1948. Earlier provenance unknown. This object is currently on display in Icons: From the MAAS Collection at the Powerhouse Museum.